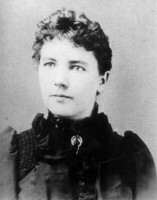 Laura Ingalls Wilder is known for writing the "Little House" series of books based on her childhood growing up in an American pioneer family. Since 1931, beginning with Little House in the Big Woods, Laura Ingalls Wilder's "Little House" books have been in continuous print. Her books are translated in over 40 languages. Laura's Little Houses: A Guide to the Laura Ingalls Wilder Historic Sites is an ebook published by the Notgrass Family. It provides information on twelve sites related to Almanzo and Laura Ingalls Wilder and their families. The ebook is free with submission of your email address (you will only receive email if you check the box to subscribe). The official site of the Little House on the Prairie documentary, the site includes history, lesson plans, activities for many ages, geography information for sites from Laura Ingalls Wilder's life, and more. A Literary Adventure for 4th Grade. Saved through Wayback Archive. Great unit study activities here and also a long list of website resources for Little House time period. Listed here are sites that provide discussion questions, activities, fun sites and author sites. The website contains information about Laura, the Wilder family and the Laura Ingalls Wilder Home and Museum in Mansfield, Missouri. Coloring pages, word find pages and book quizzes on the works of Laura Ingalls Wilder. The Laura Ingalls Wilder Museum's collections are housed in a series of buildings, including an 1898 depot, a chapel, an onion-domed house, dugout display, little red schoolhouse, early settler home, and covered wagon display.